After a few great days of bicycle riding around Mt. Adams, we came down from the mountain to 20-30mph wind with gusts to 40mph, so once again in this season of endless wind, kayak fishing was a no go. 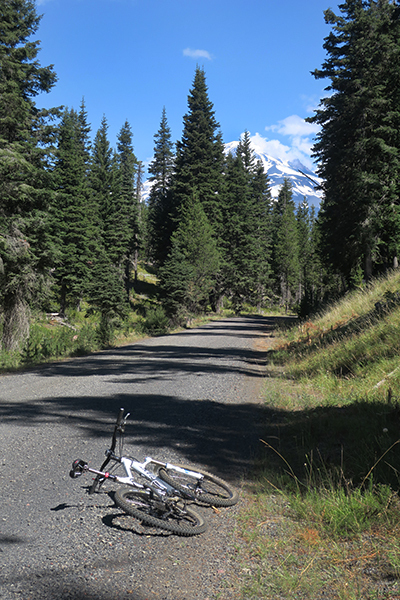 Drop off the road bike, grab the mountain bike and back into the Cascade Mountains for more bike riding. We set up camp and settled in for the night. Early the next morning, the sun came streaming through the dense Cascade Mountain forest, it was time to get up and get ready to ride. The forest is a special place. You know you are in the right place when the trails have no names. There are miles and miles of park service roads, snowmobile and cross country ski trails. Of course there is no snow so they make great mountain bike trails. Some of these roads don’t get much use and are pretty overgrown. 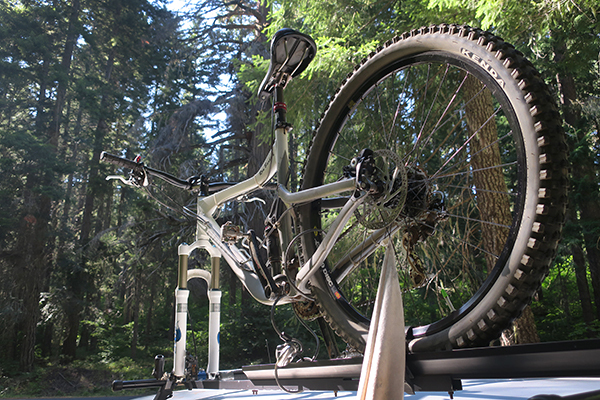 You can drive on most of the roads, depending how much you like your suspension parts and tires, but they are perfect for mountain bike riding. 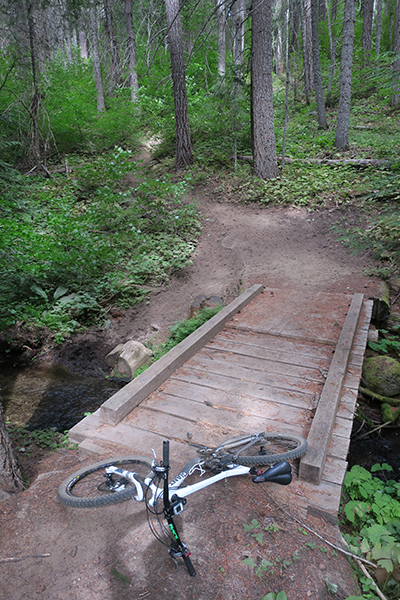 There are also plenty of great singletrack trails that provide challenges to any skill level of mountain biker. 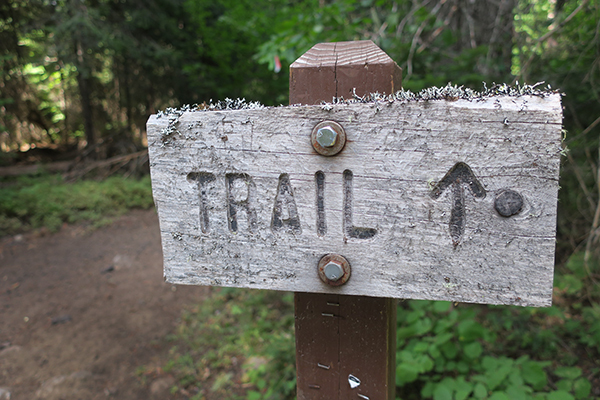 These trails see regular use by backcountry horseback riders and can get pretty dusty in the dry days of summer, but a mountain thunderstorm can get the trails back to mint condition in a matter of hours. There is abundant wildlife and great scenery along these trails, great mountain biking for all levels of riding experience. 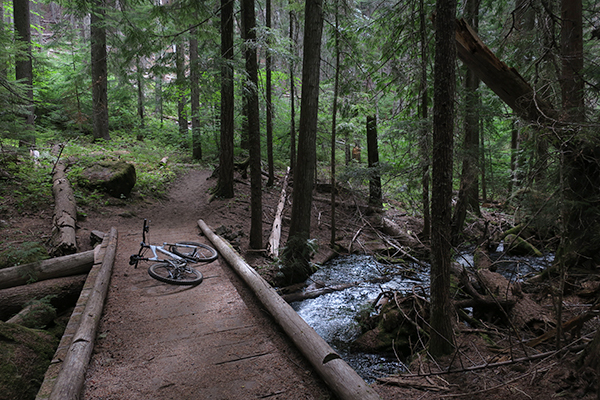 There are a lot of places to camp where you can climb out of your sleeping bag, jump on the bike and hit the trail. It’s nearly all dry camping and “pack it in, pack it out”, so come prepared. If you’re not a camper, there are places to stay in Trout Lake. We decided to ride from our camp to the base of Mt. Adams where the mountain climbing trails begin. 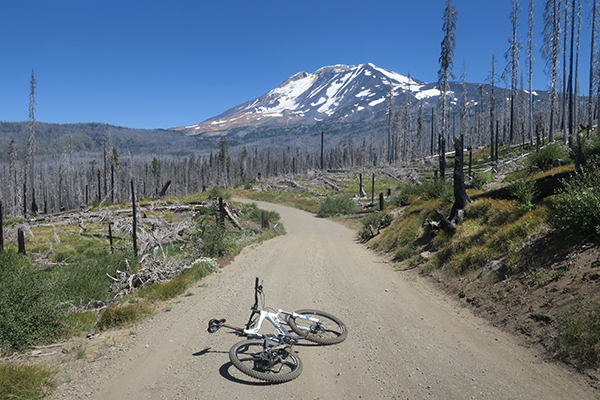 The road is pretty rough, fine for mountain bikes. The climb is not particularly steep but there are some steeper sections that usually are not too long. Mt. Adams is a large mountain, so there’s plenty of climbing on the way up. 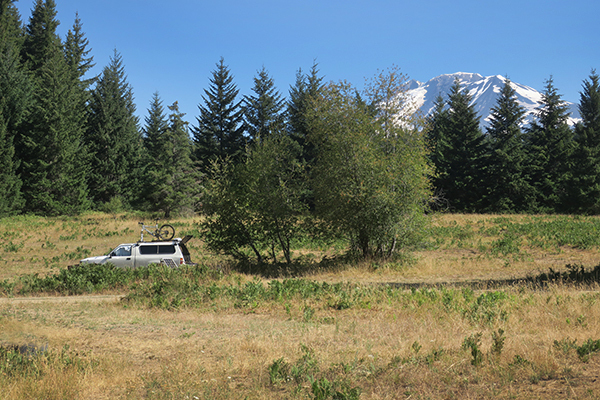 When you get to the base camp, don’t be surprised to see a fair number of vehicles for what seems to be the middle of nowhere. 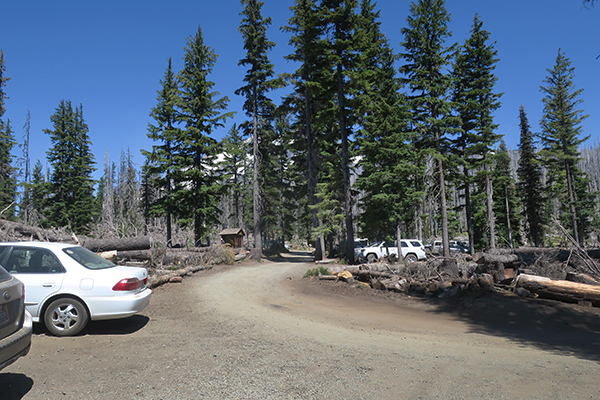 This is a popular base camp for alpine climbers as well as a parking lot for day hikers. Trucks can handle the road rough up pretty well, but the sedans and mini SUVs with street tires, I’m not so sure. These people must go through a lot of tires. The long climb up the mountain gives you a chance to check out the scenery, of which there is plenty. This is still a fairly wild area. 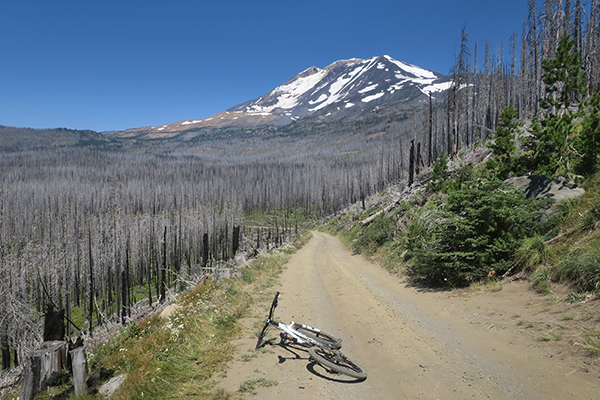 Get a good look on the way up because you will want to pay full attention to the lava gravel road down. It’s a long downhill ride back to the campsite. After the great ride up to Mt. 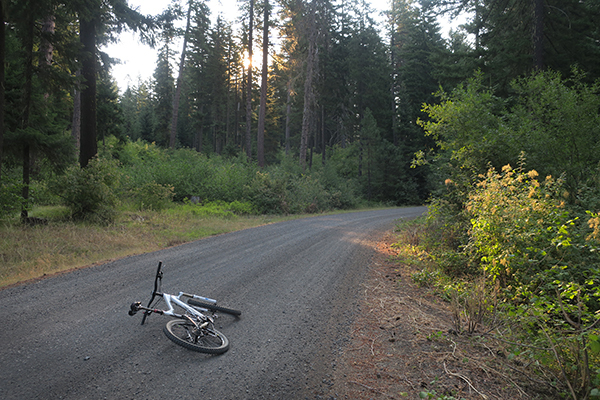 Adams on the lava gravel/dirt roads, we headed back into the woods for more trail riding. 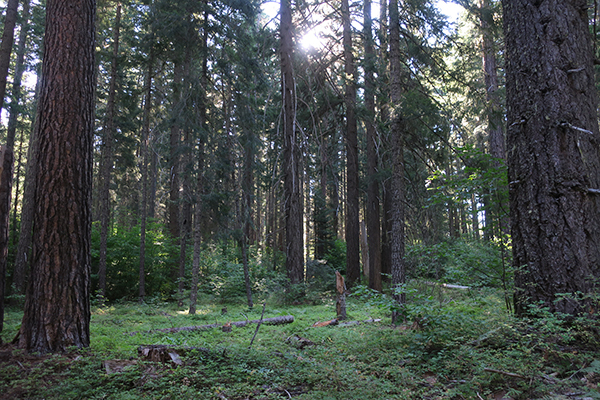 Even on a mid summer day, the forests around Mt. Adams can be a dark place. Not too terrible if it’s a hot, sunny day. 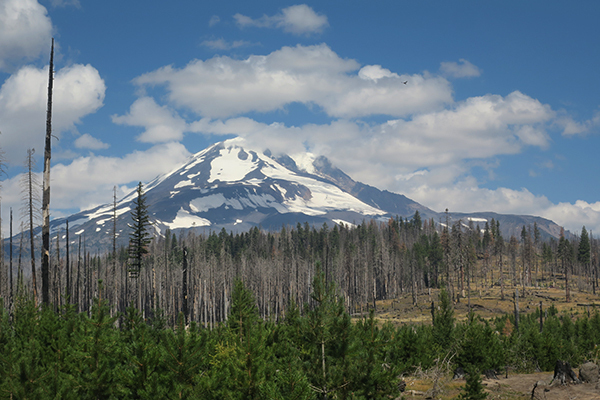 The hot summer sun melts the mountain snow and glacier ice that feed streams that flow through the forest. 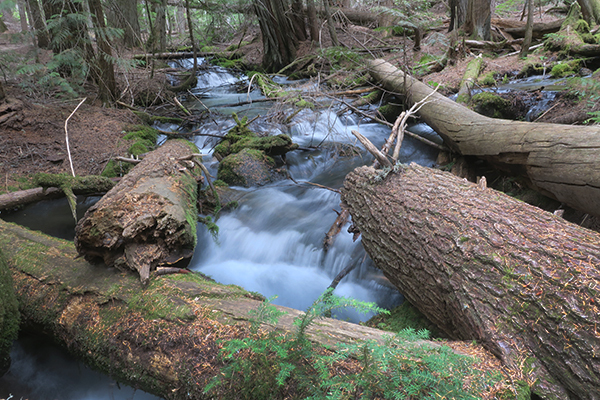 Some streams are seasonal, some flow year round. 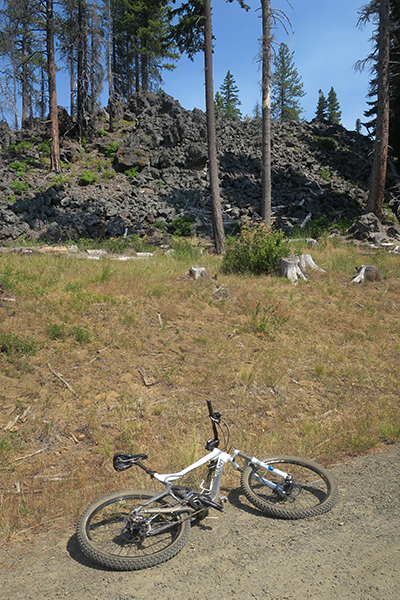 Hundreds of years ago, a lava flow from an erupting Mt. Adams stopped right here. The trails and roads are in prime dusty summer condition and we couldn’t help but think that a little rain would really clean things up. Well, we got our wish as an afternoon thunderstorm came rolling over Mt. Adams to deliver a summer downpour. 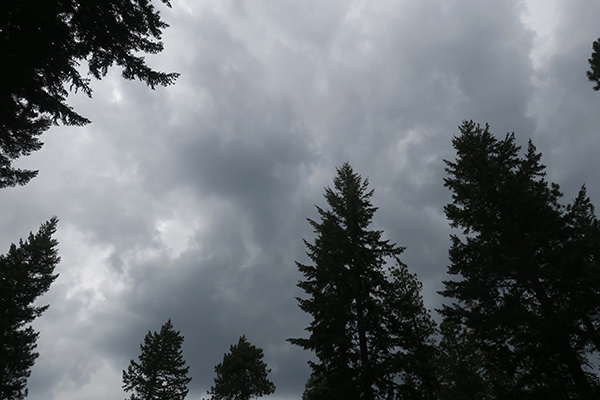 We were only a short distance from the mountain and the sound of the thunder echoing off of Mt. Adams was quite spectacular. Didn’t see any lightning or fires, thankful for that. We headed back up to Mt. Adams from a different direction for a little more exploration by bike. Mt. Adams is a large mountain and looks different from every direction. 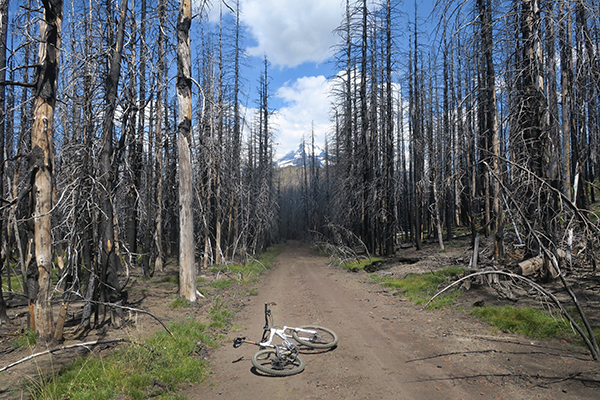 On the way down the mountain, we rode through an area that was burned by wildfire in the not too distant past. 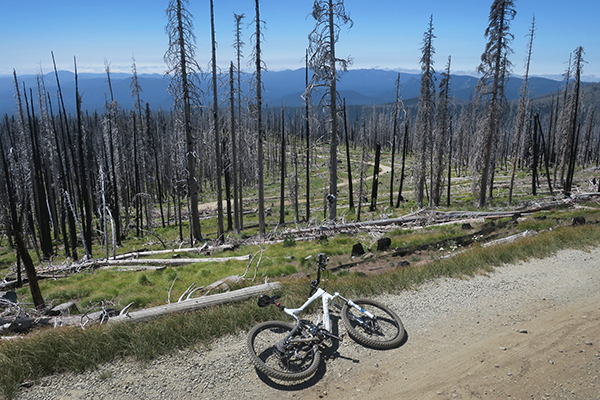 Compared to the many shades of green in the Gifford Pinchot National Forest, the blackened forest is quite the somber place. 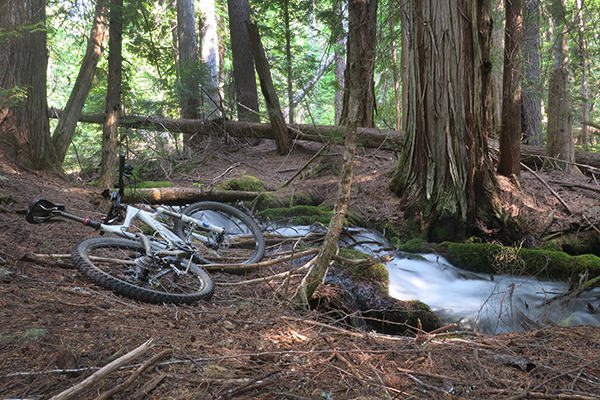 After the ride through the burned out forest, we ended the ride on a high note with some nice singletrack, fresh from the previous afternoon rain. The final day of our mountain bike began warm and humid so we got an early start up the mountain. We wanted to go out with a bang so we rode to the top of the trails on the road to get warmed up, then rode singletrack trails the rest of the ride. The trails were mostly downhill but a lot of the trail was overgrown with a number of blown down trees across the trail. 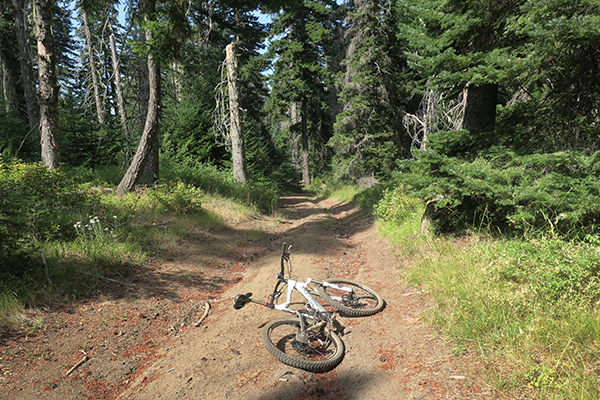 Made by horseback riders years ago, the trails in the National Forest do not get a lot of maintenance so it’s a challenging ride on a mountain bike. 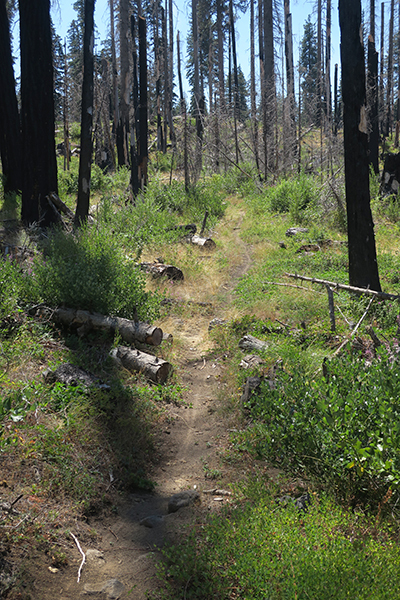 Thanks to the recent rain, the trails were in great shape with very little dust. It’s been a great trip, fantastic bike riding in a spectacular place. Time to head back to civilization, see what the internet says about the weather. We may be back on the water kayak fishing or, if it’s too windy, more bike adventures. Stay tuned because something will be happening!